The EM1206 has two LED control lines -- Status Green (SG), and Status Red (SR). Both lines have the same internal structure and the LEDs should be connected to these lines as shown on the schematic diagram below. 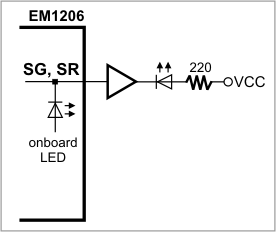 The use of an external gate is recommended because the EM1206 has its own onboard status LEDs, and those are driven by SG and SR lines as well. The combined load of the internal and external LED on the same line is too "heavy".